Do you properly secure your child when traveling in the car? Whether just making a quick errand to the store or taking a cross-country trip, assuring that your child is not only properly buckled in but also positioned safely for their age, weight, and height could mean the difference between life and death in a car crash. The law requires that you follow certain guidelines for child restraint use and certain organizations go further to provide recommendations on what’s the most safe. 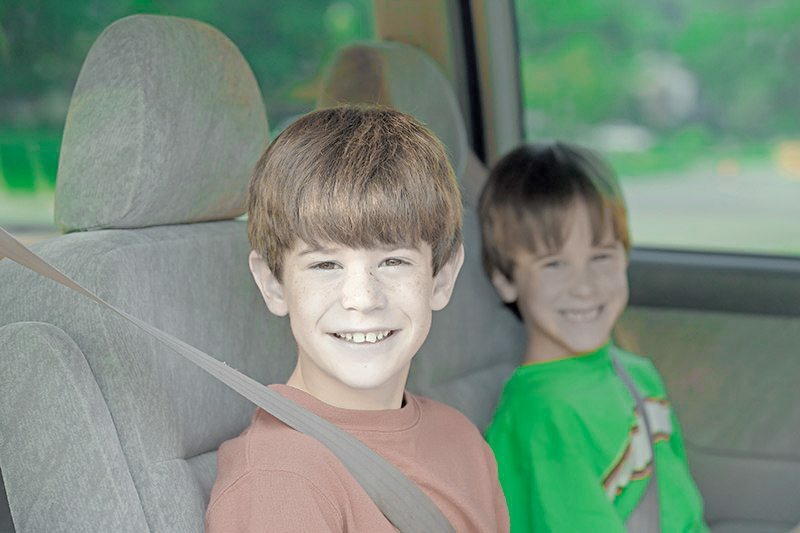 Learn more about how to keep your child safe in the car at any age. Did you know that the first child restraint systems were created in 1921 and were basically just a sack with drawstring that secured the child to the backseat? It wasn’t until 1971 that the federal government addressed the issue of children being injured and killed in motor vehicle crashes by establishing minimum standards for child safety restraints. Today, laws in every state require children under a certain age or weight use a child restraint or booster seat. How Should Your Child Be Secured in the Car? In 2013, 640 children under the age of 13 died in automobile accidents? Of those 640 fatalities, 225 children were seated in unrestrained seats. These, like many motor vehicle related injuries and deaths, are largely preventable. There are two types of safety seats for children: restraint seats for babies and toddlers and booster seats for younger children. A restrain seat can be rear-facing in which the child is facing the back window or forward-facing in which they face in the same direction as the driver. Because all children grow differently, the transition between seats will vary for each child. Safest seating position for babies and toddlers from birth to 3 or 4 years old with weight and height limits dependent on the manufacture guidelines for the seat purchased. Spreads the impact from frontal crashes throughout the complete area of a child’s back, head, and neck for utmost protection. Safe position for children 1 to 7 years old or over 20 pounds although many recommend leaving a child rear-facing until they reach the maximum height or weight listed by the seat manufacturer for the rear-facing position. Effective in restraining a child, typically with a 5 point harness, in the event of a crash but doesn’t cradle the head and neck which is especially important for infants and toddlers who have weaker neck muscles. Helps keep older children, typically ages 4 to 7, better protected in comparison to regular seat belt use by boosting the child up higher in the seat and allowing the belt to sit properly on the hips and across the chest. Less protection for frontal and side impact crashes than rear-facing or forward-facing car seats and no head and neck protection although this is less of a concern as the child becomes older and their neck muscles strengthen. The NHTSA provides more detail and recommendation on car seat use (link removed) here. Also, while buckling your child in properly is extremely important, so is not leaving them in the car unattended. It is never safe to leave a child unattended in a car. For more information and tips on how to keep your child safe from vehicular heatstroke, click here. What Does the Law Say About Safety Seat Use? By placing your baby, toddler, or small child in safety seat when riding in the car, you’ll not only help protect them if you should happen to be involved in a crash, you’ll be obeying the law. Every state has established car seat laws for evident safety reasons. However, the age, weight, and height at which children are required to us a child safety seat will vary per state. The chart below lists the age, weight, or height requirements for restraint or booster seat use by state and the fines associated with violating these laws. It’s important to note that the fines listed do not include additional fees associated with court costs or other assessed charges. For additional details on these laws in your specific state, you can visit the Safety belts and Child Safety Seats page linked under the chart.